Here's an elegant and simple card I made with the Elements of Style set from the Summer Mini. I was inspired by a trade I received from my upline, Karla Anders. 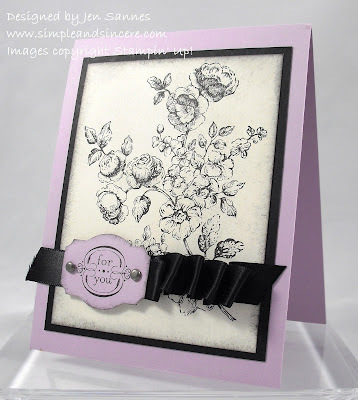 I'm trying to use lots of my retiring colors - I used Pale Plum on this card. Doesn't it look fantastic with the Basic Black and Very Vanilla? I also love the Basic Black satin ribbon - had to add a ruffle! This elegant card demonstrates that you don't need to color in the floral image for the card to look finished. Gorgeous! Visit my blog to pick up your Beautiful Blogger Award! This is simply pretty! I love your colour combo and ribbon treatment!